Here we have the very best PlayStation 4 gifts for gamers. We’re talking the best hardware, the best accessories and the coolest bits and bobs money can buy. So, if you are looking to build the ultimate PS4 setup, bedecked with PSVR, aftermarket controllers, awesome collector's editions, amazing accessories and more, then read on and enter a PlayStation paradise. Watch this! PlayStation 4 Pro unboxed! So let’s start with the heart of your gaming mecca, the best version of PS4 your money can attain - PS4 Pro. Sorry, regular PS4, you’ve been usurped by a younger model with a 4K upscaling and HDR one-two. With a GPU twice as powerful as vanilla PS4 and a larger hard drive designed to help support PlayStation VR and give developers more horsepower to work with as the second half of the generation kicks off. Now we’re getting serious. No modern gaming setup can even consider itself complete with a VR headset in its vicinity, and what better platform than the critically-acclaimed PSVR? The headset doesn’t need a PC to run, and plugs into your TV and your console via a special processing unit. Just make sure you unplug it when you’re not using it as having it connected with disable HDR on your PS4. If you’re going to have a console with 4K and HDR capabilities under its hood, you might as well go the whole hog and get yourself a top of the line, trouser-tingling super TV in the form of the Sony Bravia 65-inch model. It’s literally got it every smart mod-con you could dream of, and all that display real estate? We’re weak at the knees just thinking about the KD65XD7504BU. Now you’ve got a PSVR in your setup, you’re going to need a full-fat game to push it to its limits. For us at T3, EVE: Valkyrie’s space-based dogfighting is perfect for the sensory immersion of virtual reality and an ideal fit for PSVR. PSVR certainly isn’t lacking in sci-fi shooters at the moment, but there’s something about looking around your cockpit while fighters explode and asteroids disintegrate that gets the blood rushing like nothing else. Buy it now. There are plenty of games already on the market that support the increased graphical output and processing performance of PS4 Pro, but few are going to a) look as good and b) give you as many hours of gaming brilliance than Final Fantasy 15. A game quite literally a decade in the making, Final Fantasy 15 is one of the games of the generation, so what better way to enjoy your new PS4 Pro and brand new 4K TV than a slice of gaming excellence? Fill your boots, son. See that paltry, flat-packed excuse for a TV stand you have now? Take an axe to it and dismiss it from your abode for good. You, dear reader, need something with a little more pzazz. A unit with enough space options to support everything from consoles to speakers. The Spectral Scala SC1651 TV Stand has it all, and with a choice of sleek colours and finishes and an in-built audio system, you’ve got one hell of an entertainment hub ready and waiting for your tech to settle upon it. Regarded as one of the best Surround Sound systems ever made, the German-hewn Monitor Audio Radius R90HT1 is just something else. With four Radius 90 speakers to position around your chosen gaming palace of choice, a single Radius 200 in the centre and a Radius 390 subwoofer with 200W amp you’re getting a veritable smorgasbord of sound. With the power of PS4 Pro and your Sony Bravia 4K Ultra HD TV taking care of the visuals, you need something to keep that audio component full-bodied and crisp to the lugholes. Whehter you’re watching a film on Netflix or investing in a videogame, this setup is a must. PS4 Pro is a beast, both in terms of its performance and graphics upgrades and the sheer size of its girth, but it’s sadly lacking in one quite vital area: 4K Blu-ray playback. The lack of an Ultra HD drive is a real loss for the console, but that doesn’t mean you have to go without. If you want to enjoy the new high-end standard in home entertainment media, why not invest those hard earned sheets in a Panasonic UB900? With Proprietary Chroma processing and HDR-to-SDR/HD-to-UHD remapping, this Ultra HD Blu-ray player will do all your 4K films serious justice. Okay, now we’re talking. With all that glorious performance, crisp 4K visuals and sultry Surround Sound bathing you in sensory elation, it’s time to settle back in a throne fit for a virtual king. So what better way to recline than in one of these super-ergonomic X-Rocker gaming chairs? The Elite Pro model has been designed with PS4 (and Xbox One) in mind, so it’s an ideal pairing with your PlayStation-focused setup. With Bluetooth connectivity, this little beaut has in-built motors for feedback vibration and even comes with its own 2.1 audio system. These headphones aren’t even out in the UK yet and we’re still including them because they’re so freaking good. The Arctis 7 model (which is accompanied by the Arctis 3 and Arctis 5, both of which have launched over here already) is gaming audio at its delicious best. Where do we start? Continuous frequency-hopping technology that keeps PS4 Pro games or VR titles from lagging? DTS Headphone:X 7.1 Surround Sound? The noise-cancelling, bidirectional ClearCast Mic? The list is near endless. If you want to game and chat, this is as vital as an organ. The PlayStation camera, once a forgotten addition that seemed destined to die when PS4 launched in 2013, has found a new lease of life with the arrival of PSVR. The PlayStation Camera is there to track your movement in a 3D space and ensure the virtual world around you is as interactive as possible. Said camera can fit on top of your TV, or positioned below it depending on how you’re positioning your 4K wonder telly. Either way, at less than £40 the PlayStation Camera (in both its new version and old) is a prerequisite for PSVR that’s not included in the headset itself. Once launched as a motion-control rival to Microsoft’s soon to fail Kinect accessory on Xbox 360 (check out the video below to see Move in its original form), the PlayStation Move controllers are been rebranded as a PSVR move accessory. While you can use the DualShock 4 controller as a move peripheral, we’d advise plumping for a couple of these Move controllers if you want to enjoy the full-range of movement and tactile control while using PSVR. The PlayStation VR Official Headset Stand is constructed from obsidian and comes with an adjustable metallic base and cable management system. In addition, it can support the headset at any height between 38-48 cm and weighs in at 2.3kg, meaning that it isn't top heavy and easily knocked over. Engraved Numskull and PlayStation VR logos complete the package. If you’re picking up a PS4 Pro and building yourself a PlayStation haven to die for, you’d better be investing in one of the most important and rewarding accessories you can buy - a sick fightstick. Street Fighter V pre-launch event: T3 discovers it’s never too late to get your HADOUKEN on! Hori, being the one true master of fightstick designs, is the go to brand here and its PS4 Arcade Stick VLX is an absolute must. Perfect for Street Fighter 5, Mortal Kombat X and more, it’s designed to replicate the classic ‘VEWLIX’ arcade cabinet and even has a top panel that opens out. After three years of DualShock 4, Sony is finally officially endorsing some third-party controllers. 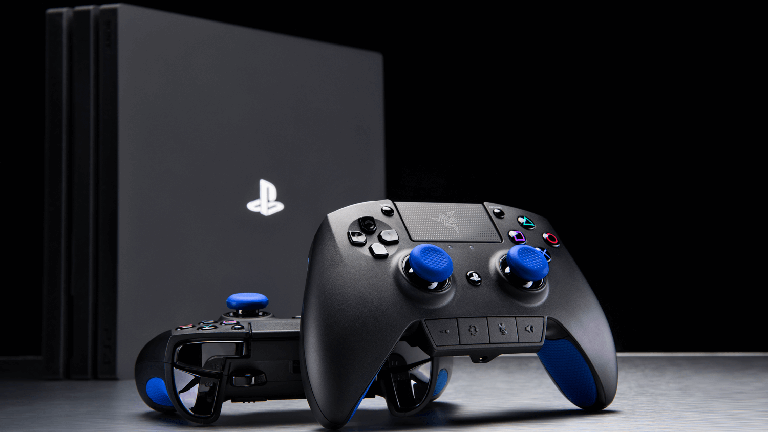 Of the two, the Raiju Playstation 4 Controller from PC peripheral manufacturer Razer is easily the most impressive. It comes with four additional fully-programmable buttons, a weight and shape that’s been fine-tuned and a super handy Quick Control Panel. TLDR: if you’re thinking of getting into eSports, this is the controller for you. Should the delights of a PSVR headset or a sleek 4K Ultra HD TV still not be enough for you, how about a powerful portable projector to turn one of the walls in your home into a giant gaming screen? The 1920x1080p model from Distianert offers an impressive 1,200 lumens meaning your game or film of choice won’t get lost in the lighting of the room, or get its colours or details washed out. If gaming on a cinema-style screen is your thing, get this on your wishlist. Space often comes at a premium, so having a charging dock for multiple PlayStation items is a god send. Take the Sony Dynamo Charging Station, which comes with space for a single PSVR headset, a single DualShock 4 and two PlayStation Move controllers. There are also two extra USB slots, offering space for even more device charging. It’s slimline design won’t take up too much space and since it’s officially licensed, you know you’re getting a perfect fit for your PlayStation hardware. As a controller, DualShock 4 is one of the most intuitive and rewarding gamepads we’ve ever used , but that doesn’t mean it’s perfect. The plastic casing can often get a little slippy after prolonged use, so it’s best to invest in a decent grip. The SquidGrip is one such solution, fitting over the contours of the pad is pretty easy and since they’re sticky, each one won’t slip. If you’re someone who loves playing shooters or RPGs for long sessions, these are a brilliant little purchase. As the winter months set in (and continue on like an endless season of Game of Thrones), getting yourself a good jumper or sweater is an easy decision to make. And, since you’re building the ultimate PS4 setup, why not keep 100% on brand with an official Sony one? Yes, you can really buy PlayStation-themed jumpers. They come in a variety of colours and designs, meaning there’s bound to be a knitwear choice to suit your tastes and size. With your PS4 setup almost complete, it’s time to invest in a little culture. Nothing screams ‘cultured’ louder than a big coffee table book full of brightly coloured pictures, and this one just happens to cover 20 years of PlayStation’s most recognisable icon - Lara Croft. It’s a pretty impressive piece of work, detailing Lady Croft’s earliest origins at Core to her reinvention at the hands of Crystal Dynamics. If you’re even a passing fan of the Tomb Raider phenomenon, this publication is a must-have. What better way to finish off your new and imposing PS4 home setup that a little themed decoration? We love a good collector’s edition here at T3 Towers (and by good we mean one that doesn’t define ‘collectors’ by some postcards and a soundtrack sampler), so we love the special Libertalia Edition for Uncharted 4. Apart from getting a copy of the game in a limited edition steelbook (a game that’s been given a rather fetching PS4 Pro mode and a new multiplayer component called Survival - see the trailer below), you also get a 12-inch premium Nathan Drake statue by Gentle Giant.